“Don't know the manners of good society, eh? 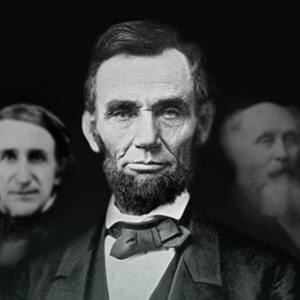 Well, I guess I know enough to turn you inside out, old gal — you sockdologizing old man-trap..."
John Wilkes Booth slipped unnoticed into the Presidential box and, standing four feet away from the President, discharged a single bullet from a derringer into the back of Lincoln’s head. The short-barreled pocket pistol shot a round lead ball at a very low muzzle velocity - about that, say, of today’s air guns. It was enough, however, to render Lincoln unconscious and paralyzed. As Booth escaped from the theater, a young Army surgeon, Charles Leale, made his way through the audience to Lincoln’s side. He determined that the wound was mortal, and ordered the stricken President carried across the street to a neighboring boarding house. There, because he was too tall to fit lengthwise, Lincoln was laid diagonally across a small bed - which, on previous occasions, had been slept in by his assassin, Booth. When Lincoln died the next morning, he became the first president to be assassinated. He would not, unhappily, be the last. Three more presidents would be assassinated - and yet another eleven the objects of assassination attempts. Printed Theatre Ticket, unused, for a Reserved Chair in the Orchestra section at Friday’s performance of “Our American Cousin” Ford’s Theatre, Washington, April 14, 1865, with large circular ink stamp, “Ford’s Theatre/ This Night Only / April 14, 1865.” 4 1/8 inches by 1 3/4 inches, on thick card stock with a bright yellow surface, and bearing the printed signature of manager James R. Ford. On the verso, an Autograph Note Signed in the hand of famed coin dealer James W. Haseltine, dated July 14, 1865, certifying that this original ticket, for the night Lincoln was assassinated, was presented to him by James R. Ford. Give this portion of the Ticket for entrance to the Door-keeper.